E3 is happening this weekend, and Nintendo has plenty of events taking place - kicking off the with a special Smash Bros. video broadcast and the much-hyped return of the Nintendo World Championships. 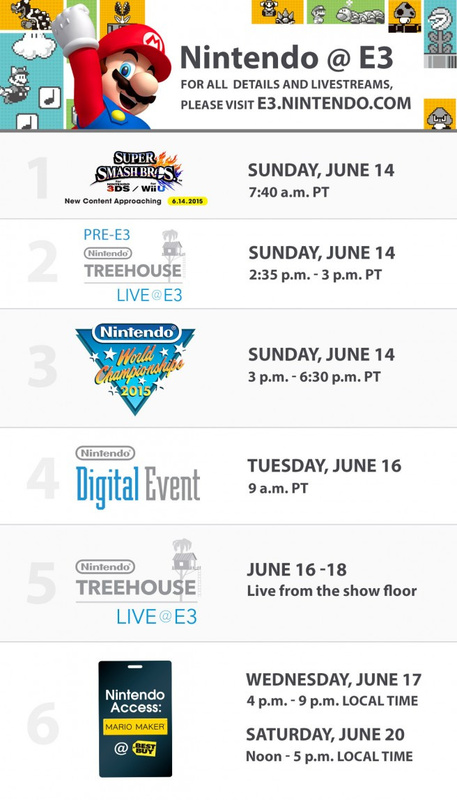 We've also got the Digital Event to look forward - surely the biggest part of the whole E3 schedule for Nintendo fans - as well as Treehouse Live broadcasts with developers. To make it a little easier to plan the week ahead, Nintendo of America has released a handy schedule guide, which you can view below. A special installment of Nintendo Treehouse: Live will preview all the action of the Nintendo World Championships 2015. The show runs approximately 2:35-3 p.m. PT onhttp://e3.nintendo.com. For the first time in 25 years, a Nintendo World Champion will rise. Eight winners from regional qualifying events will meet eight invited competitors at L.A. LIVE in Los Angeles for a multi-round Nintendo game competition, but only one will be crowned the 2015 Nintendo World Champion. Tune in to the main event 3-6:30 p.m. PT onYouTube, Twitch and at http://e3.nintendo.com. Listen in for additional announcements between matches. Los Angeles-area fans hoping to attend the competition can visit http://e3.nintendo.com for details about free tickets. Get Nintendo news about upcoming games and experiences straight from the source via the Nintendo Digital Event online video program. Tune in to http://e3.nintendo.comat 9 a.m. PT for the live coverage. Watch Nintendo Treehouse staff live from the E3 show floor as they deliver in-depth coverage of Nintendo's lineup, including live game play and appearances by Nintendo developers. This interactive show kicks off immediately following the Digital Event live stream at http://e3.nintendo.com and is scheduled to run daily throughout the show. The final day of the show kicks off at 9:55 a.m. PT. Staff from Nintendo's Treehouse will be joined by Nintendo game developers for last looks at our E3 lineup. Visit http://e3.nintendo.com to watch live, and then relive Nintendo's E3 2015 show highlights. We'll be streaming all of these events with a live blog and chat here on Nintendo Life, so it should be a fun week. What are you most excited about? Nintendo really needs an E3 app on at least Wii U, probably 3DS, and maybe iO Sand Android. I know the Wii U web browser is good, but clicking on app gives all of this more exposure. Heck just let the app bring up the broswer and go to their E3 webpage. I call it - exposure. my body is... oh crud, i can't remember! but it sure is! I didnt know they had plans for Sunday, that's a nice pre-E3 line-up. @rjejr Absolutely! And as far as I'm concerned, the Wii U web browser is far from good - at least when compared to proper PC internet browsers such as Firefox or Chrome. @ricklongo - I don't compare any Nitneod hardware to any real electronics, but compared to Wii's web browser, or the 3DS, it's awesome. Or the PS3 for that matter. Ever used the PS3 web broswer? I don't see how anybody can like that, and Wii U is seriously much better. Best thing about Wii U browser, watching the video on my big screen tv while I can read and comment on the NL live feed on the Gamepad. It's not ideal, but I like how it works. That's how I'll be watching and commenting on the E3 digital event. Sure we know the start times of the Treehouse streams but what about the finish times? I'd like to know whether I'll be in NL live feed for 8 hours a day like last year! I love they are doing the Treehouse @ E3 again this year. Hopefully it will be as much as it was last year! I watched almost constantly for those three days. Although I did suffer some withdrawls when they wrapped up. I am excited about E3. I just wish the Demo Days thing wasn't limited to so few stores in Canada. Hype! I hope HW is not the only 3DS surprise they had in stores! 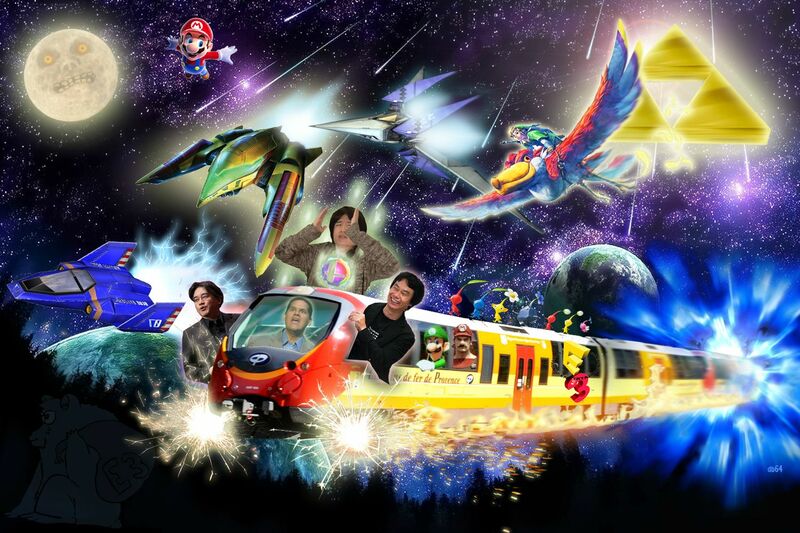 I am the rider of my hype train. Ready is my body, Fire is my blood. I have created over a thousand wishes. Have withstood pain to create much free time. Yet these hands will never hold enough money. So as i pray Unlimited Games Works. @Damo - You know, honestly, I think of you and that silly article every time I do. But then I always wish the Gamepad had a secondary WiFi chip in it so I could use it as a tablet more than 8 feet from my tv. I just wish the Gamepad could switch from the proprietary connector to a WiFi connection to the Wii U when it got out of range. Not for gaming, but for all the other tablet stuff: web browsing, Miiverse, eShop, Netflix, Hulu Plus, Amazon, Crackle etc. My wife's phone has no problem switching between cell coverage and our WiFi in the house. Or anywhere else that has WiFi. And it's not a state of the art phone, it was $100 w/o a contract, but she loves it. And I know the Wii U can handle it on it's end. When we played 8 player SSBU w/ three 3DS the 3DS never lost connection. I tried out how far the 3DS could go while still controlling the characters on screen, but they never lost it, not even on the 2nd floor of my house w/ the Wii U in the basement, so Wii U WiFi has range, even for fast paced gaming like SSBU. Though I suppose there may be lag that good players might notice, we mostly just play games for fun, we're weird that way. Sorry for the long rant, just remember who started it. Now go get some sleep, E3 is coming. I can't even sleep anymore! Partly pre-e3 excitement, partly "Splatoon" Super Snail harvesting. What's times are these in general Europe/uk time do ya know? I will pretty much just do catch up reading about it all here at NL. Really wanting some good announcements for the 3ds, but not counting on it. 9 am PT? What does that mean to people in the UK? Sooooo, what are the eastern times? Dear Nintendolife , some of us don't live in America! How about telling us European folk what time to check it out. Us in Europe outnumber you lot you know!!! I'll be watching everything on the big screen with my Wii U. With my phone in hand to live chat with you guys. @rjejr How's it compare to the New 3DS? @NintendoFan64 Get me a ticket! that is one nice hype train. @ShanaUnite I get that reference. Finally I understand references. Just use Google guys...it's pretty simple. My Tuesday vaacation is approved. My body is ready. @CrimSkies97 - I have no idea. @Shiryu - Finally finished single player yesterday, sitting comfortably at level 16, guess I have another reason to work on leveling up now. Is the splatfest everywhere Jun 20th or just Japan? I've read it's in the west June 27, but I've also read its in the US June 20th. Basically every website I googled has a different date. @rjejr I don't know anymore about the Splatfest, Yrsterday I read 20th, but today I read 27th. We will have to wait for e3 for confirmation. We will just have to stay fresh until then. How long does a digital event last? I need to know how much pop corn to order. @Shiryu - Thank you for your honesty about not knowing specifically about the date, very re-fresh-ing, some people would just continue to claim they were right and let it go at that even if they knew they were wrong. I'm hopeing for the 20th myself, have a Met game to go June 27th at 4PM. @rjejr Heck, you will never find me around here or anywhere else talking about things I don't know. @rjejr Yeah, I like the way the gamepad works there, too. I'm often watching, say, a YouTube video on the TV while searching for the next one on the touchscreen. It might just be my favorite use of the gamepad anywhere. Will the direct be viewable after the event? I'm working up until Tuesday so I'll only be able to watch Wednesdays treehouse live. Here's hoping that Retro brings us a new Metroid, or a brand new IP. @Kirk Totally off-topic but wanted to let you know, as promised, that I've read your story and I actually quite enjoyed it. I was also a bit disappointed because of how it ends (for the moment, I presume), because I couldn't find out what happens next. @Kirk Then who the f**** is the father's "friend"? It's just meant to make you think: "What could be so dangerous that the father simply will not let his children out the house...?" Wait...I mean...yeah...that's it...or that COULD be it! @Kirk Either way: nicely done, sir. If you've had the time to read it, let me know what you think.. I'm really hoping for some big new announcements and worthy surprises. They're both classics by Isaac Asimov. @Goginho Why so glum? Forecasts are actually pretty positive in general, if you look around the web. They obviously can't make everyone happy, so some people are bound to be disappointed, but other than that I'm feeling pretty confident that it's going to be a good E3 for Nintendo. I think I can make it to San Diego on Wednesday afternoon. for the streetpasses, if nothing else. Maybe there will be some surprise other than Mario Maker too. Anyway, hoping for some good announcements come Tuesday. I don't think anyone has picked up on it yet, BUT the Nintendo Treehouse Live Pre-Show ****STARTS at 2:20PM and ENDS at 3:00PM****. It's even written on the nintendo e3 page. Looks like it's 40 minutes long and not 25 minutes. Tune in at 2:20PM instead of 2:35PM or you'll miss out on a whole 15 minutes of the show! Just give me a Zelda U trailer + name reveal and I'm happy. And here I am stuck in ward work for about 12 hours on that day. I would miss the live event on Tuesday. I'm glad that the Digital Event is at a sensible time for Europe (5pm in the UK), unlike some other companies. Sony, I'm looking at you here. I need to get this off my chest: I LOVE the new site layout for E3! and how it shows when everything is happening in my timezone. Awesome job Nintendo Life! @NintendoFan64 I love that image you posted. The "Moon" and Mario Galaxy" images are always welcome. @Damo how come only American Times? Being a UK site, shouldn't the euro times be posted? 1.) Wii U true sequel to Madworld. 5.) Anything including more details for Art Academy Atelier Wii U, I.e downloadable specialised lessons, e.g. drawing manga and anime. 8.) Anything about a bundle of all three seasons of Sam and Max. 9.) More details on Pokken Tournament.